After last week’s super fight in Dallas and the start of college basketball’s annual March Madness tournament, boxing didn’t exactly take a complete back seat in the world of sports. Sure, opening day for baseball is set for later this week along with the continuation of college basketball’s tournament, but, unlike in other years when boxing would tend to take a hiatus during the weeks in the holiday season, all four major sports have key dates in October, the dog days of summer, and the spring. Boxing this year continues to heat up on the calendar with several major shows still yet to take place. This weekend shows, promoted by major outfits, found a way to fit into the already hectic sports schedule. This is yet another indication that the sport is dealing with a renaissance with the various platforms that have invested in boxing. Top Rank Promotions and ESPN used this weekend to showcase a returning former world champion and a top heavyweight contender in a fight that was more than just a stay busy assignment. Former WBO Jr. Featherweight Champion Jesse Magdaleno (26-1)( 18 KOs) returned to the ring for the first time in close to a year with a ten round decision win over former world champion Rico Ramos (30-6)(14 KOs). Last April, Magdaleno lost his jr. featherweight championship to Isaac Dogboe in a fight that was as brutal in terms of the physical punishment that both fighters absorbed. While Magdaleno came up short, after an extended time away from the ring to regenerate his body and mind, Magdaleno returned this time making his debut in the featherweight division. It was a good performance by Magdaleno as he showed that although he was off for a full year, he didn’t seem to have any major lingering obvious effects from his war with Dogboe. He was able to move fluidly as well as pull the trigger with both his jab and combination punching. Ramos on the other hand had trouble letting his hands go and it looked as if he was overthinking the fight, while Magdaleno was fighting instinctively. This is a good sign for Magdaleno, since many undefeated champions after a brutal loss can show signs of losing a step physically and mentally (confidence) in his abilities. Although this fight with Ramos was a true cross roads fight for both men, it is indeed a good sign for Magdaleno that he seems to have put last April in the rearview mirror as his career begins its new journey. Moving forward there are some real good options for him for some big fights at featherweight. One of those options was mentioned during the broadcast, a fight with his stable mate and current WBO champion Oscar Valdez. Yes, it’s true they are friendly with each other, but business and championships shouldn’t get in the way of this fight being made. 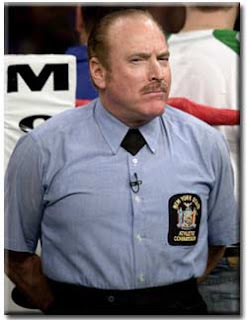 When it is made, sign any boxing fan up to watch a fight that easily could be a fight of the year candidate. From the looks of Magdaleno the featherweight, the only thing that was noticed was the fact that while he showed real good power four pounds lighter at jr. featherweight, fighting as a full featherweight may be the heaviest division for him to compete in in terms of his natural power. Which again, will make a fight with Valdez even more interesting. 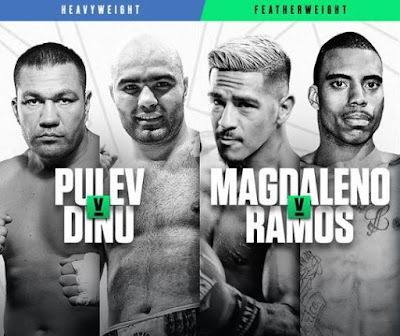 Heavyweights were the main event of the night, with Kubrat Pulev (27-1) (14 KOs) winning by TKO in the seventh round over the game Bogdan Dinu (18-2)(14 KOs). Coming into the fight, Pulev was rated as the number one contender in the rankings by the IBF. This means he could have easily waited for a chance to have the sanctioning body force a fight with their current champion Anthony Joshua, or have him fight for the vacated title if Joshua would chose not to fight him. With Top Ranks recent signing of the lineal champion Tyson Fury, Pulev and Top Rank understood that it would be wise to showcase Pulev in a solid matchup to increase his name recognition to make a fight with Fury in the future more appealing. This gamble was worth it both in terms of future business and entertainment for fans watching on ESPN. Pulev survived some powerful right hands from Dinu that caused a serious cut over his left eye, that put the outcome in jeopardy for Pulev. A sense of urgency took over and Pulev answered any questions about his grit and determination as he battled back to stop Dinu. In the process, he gained the recognition needed to justify a shot against any of the top three champions in the division, as well as interjecting his name into the minds of the casual boxing fan that follows the heavyweight division. It was a successful night for the fighters and thus a solid show for Top Rank Promotions during a weekend being dominated by what was taking place around the country on the hardwood. While Top Rank squeezed in their card on Saturday night, Premier Boxing Champions (PBC) broadcasted their show on Sunday evening from Maryland featuring a welterweight fight between Lamont Peterson (35-5)( 17 KOs) and Sergey Lipinets (15-1)(11 KOs). 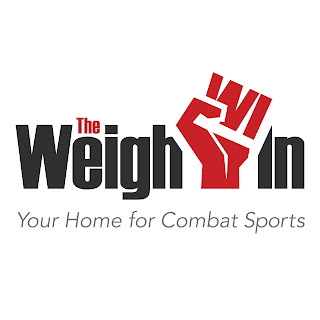 Going into the fight, with the welterweight division being the hottest in the sport outside of the heavyweights, Peterson and Lipinets were trying to stake their claims that their names should also be mentioned with the current champions and big-name contenders for future fights. Peterson, for his part, had already fought most of the big names in the division and was trying to make one last run at championship glory. Lipinets, was setting out to prove that after his lone loss at jr. welterweight against Mikey Garcia, was behind him and that he is ready to face key opposition as a welterweight. Normally my thoughts would include things that took place throughout the entire card, which included some entertaining fights. However, in this case, the main event went above any expectations and turned out to be a solid fight. With both fighters aware of their current career positions, they wasted no time trying to establish that it was going to be their evening. Everything that Peterson did throughout the fight consisted of veteran moves, which at times had Lipinets confused. Peterson dedicated his attack to the body with whipping right hands and left hooks. At times, some of the shots wandered a bit south of the boarder to stop Lipinets from coming forward. These veteran tactics were met and countered with energy from Lipinets, the fresher of the two fighters. As the fight progressed, Lipinets was down on the scorecards, but continued to plow ahead and never wavered from his approach of applying pressure and throwing power punches. 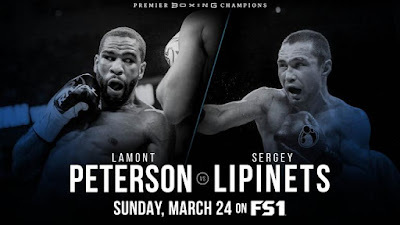 After a ten-round war, Lipinets kept scrapping away with his punches, which caused Peterson to abandon his veteran moves and accept he invedibable. After taking several last stands against his younger foe, Peterson was clearly hurt at the end of the ninth round and hung on to hear the bell. The inevitable came to fruition in the tenth round when Peterson was dropped to the canvas for the first knockdown of the fight. Bloodied and clearly beaten down, his trainer and father figure Barry Hunter decided that his champion had enough and threw in the towel. It was clearly a decision that might not have been easy for other trainers to make on the behalf of Peterson’s well-being, considering that he was ahead in the fight. However, for Hunter it was clearly an easy choice to make. Once the announcement of the result was made, Hunter took the microphone and along with Peterson stated that his fantastic career had come to its end. Thank you to Lamont Peterson for his entertaining career and dedication to the sport of boxing. He always handled himself in a professional manner and gave fans and the media access to his incredible story that saw him rise from the streets of Washington D.C., as a homeless youth with his brother Anthony, to becoming a national champion and standout amateur before becoming a two-division world champion. His five losses came only against other world champions, and aside from his losses to Errol Spence and Lucas Matthysse (during Matthysse’s solid run), Peterson was competitive in all his fights and gave everyone he fought fits. His career best win came against Amir Khan in a great fight in 2011 and unfortunately there was never a rematch. As for Lipinets, his name will now be thrown around as a possible opponent for any of the welterweights affiliated with PBC. He most likely will get his shot at one of the main names when the business of some of the bigger fights may get in the way from being made. Fights against Thurman, Porter, and even a fighter like Ugas would be interesting while they last, however, those outcomes may be a little easier to determine considering the fact that a younger Peterson would have most likely had his hand raised in victory last night.